This hike is actually a series of little hikes tied together. The area around the Cispus Learning Center has a number of hiking opportunities, none of which are very vigorous, except the climb of Burley Mountain. I did not include Burley Mtn on this CD. 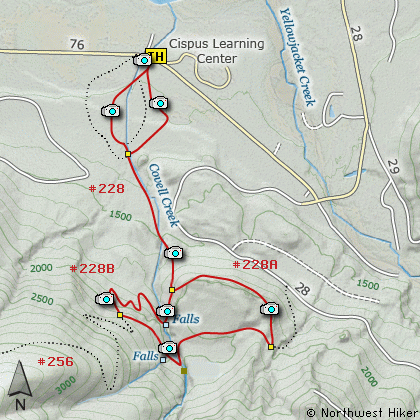 I parked in the Cispus Learning Center parking area to do this hike, but you don't need to. If you do, please let them know what you are doing, don't just take the parking area for granted. Walk across the road an begin the hike up Covell Creek. The trail criss-crosses the creek with a couple of bridges before it begins its serious climb. At about 1.5 miles the trail splits. Take the right turn, as you will eventually come back via the trail to the left. Just a few feet past this junction you will come to the first falls, which I call Covell Creek Falls. One of the unique things about this falls is that the trail goes behind falls. 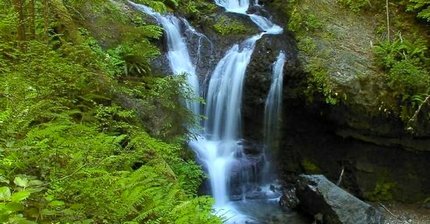 This is a pretty little falls and well worth the walk to see it. The trail continues past the falls and begins a rather serious climb up a ridge. In about a quarter mile the trail levels out then begins downhill. Soon the trail meets up with the Burley Mtn Trail. Bear left and head downhill to Angel Falls. This is another small but beautiful falls and well worth the effort. Now continue on down the Burley Mtn Trail until you come to the return trail that takes you back toward Covell Creek Falls and the junction that you passed just before that falls. You will now walk below a steep cliffy area that is unique in its own right. When you get back to the junction you passed earlier, bear right and head back down the mountain the way you came up. When you come to the 1st major bridge, bear right and cross the bridge and take an alternate route back to the beginning of the trail. I'm assuming that the yellow rope along this section of the trail is for the sight impaired. From Randle, travel south on State Road 131, crossing the Cowlitz River and in a mile you will come to Cispus Road on your left. Bear left and follow Cispus Road, which become Forest Road 23, for another 5.2 miles and you will pass Forest Road 55 on your left. Continue on FR23 for another mile and you will pass Forest Road 083 on your left, which is the road to Layser Cave. But you keep straight ahead on FR23 for another 1.9 miles. You will then come to the junction of Forest Road 28. Turn right on FR28 and cross the Cispus River. A mile from SR23 you will come to the junction of Forest Road 29. Bear right onto FR28 and drive a short distance and you will come to Forest Road 76. Bear right onto FR76 for another 3/4 mile to the parking area for Cispus Environmental Learning Center. The trail is just across the road from the parking area.